I checked motive but i couldn't find any USD GIC on their website ? I emailed western bank , i hope they could open an account for ontario residents as me and my wife don't want to put all our eggs in one basket. Look at this. ITrade offers one US$ GIC. They have Canadian too. Make sure you find out how to avoid annual or quarterly fees for their cash account. Trades per month or minimum dollars invested...email them for info. Thanks charlotte , beside the 3% tangerine vs the 2.58% of BNS for 1 year . Is there any othere advantage that the Itrade account would offer me in regards to security , insurance or tax implications ? 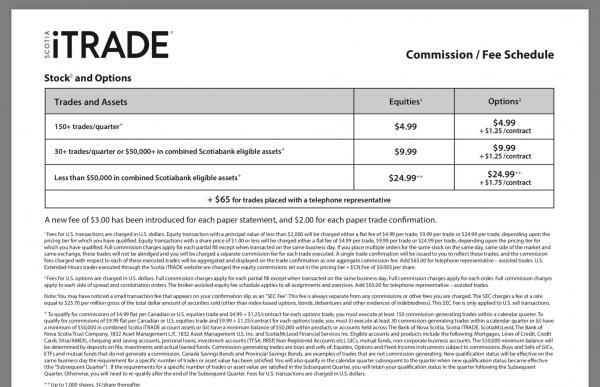 ITrade has TFSA, Cash, RRSP, and RRIF accounts. Watch for their account fees, though. They have a lot of free trades, see their list. Stocks, bonds, GICs, Mutual Funds and ETFs. Other wise their trades are as in pic. GICs are free to order too. It all depends on your risk tolerance, age and good research and planning. And if you are going online brokerage route, find the one that best suits you. So if I buy A GIC/Itrade of BNS would that make my investment more secure? My main intention is to find something with a zero risk for a year or two to park our money until we decide how things will work out for us in Canada as we are newcomers and in late thirties and we are studying to get our licenses to practice. We don't have solid idea where to settle/work and buy home yet. Tangerine's offer of 3% for a usd gic is very attractive but I started to get afraid when i read about the cdic thing ! As this made me believe that usd investments in Canada are not safe! Back home i used to be more basic/naive in my financial planning. My policy was as long as my money is in the bank then it is secure whatever currency it is ! But this changed since i started to read through this forum! No, iTrade would do nothing for you insurance wise. But you would be dealing with one of the big 5 that are unlikely to go under. But saying that likely would not make you comfortable. CDIC is good, nothing to worry about. BUT it only covers CDN funds and no investments over 5 years. Google it for more details. Credit unions in most cases do insure US funds. Ask before you leap. Not too many FIs give a good rate for US funds as I doubt an American FI would offer a good rate for CDN funds. What do you plan to practice in Canada? If it is your intention to remain somewhere in Canada, even if you don't know where yet, then your location shouldn't affect which Canadian financial institution you use. If you're not sure you will remain in Canada, then you should probably stay mostly in USD for now. I't's a trade-off between higher rate and more security, I suppose. Still, I find it hard to imagine a situation where Tangerine could fail while MB Deposit insurance remained reliable. Perhaps there is some way you can buy US Treasury bills in Canada? Someone else will know more about that than I do. Without deposit insurance, the risk of the US$ GIC depends on the issuer. Province of Manitoba has A(high). So, the estimated risk of any Bank of Nova Scotia GIC, before CDIC insurance, is around that of a Province of Saskatchewan bond. Unfortunately, there is no rating for Tangerine Bank. So, one does not know what the exact risk is for a Tangerine GIC with no deposit insurance. This morning, the one-year US$ pay Bank of Nova Scotia GIC is 2.45%. The one-year Tangerine Bank US$ GIC pays 3.0%. I wouldn't take on the unknown risk of a Tangerine Bank US$ GIC for just 0.55% more. I actually meant by i dont know where im settling in canada is that i dont know where i will find work when i get my license , so i dont know where im going to buy a house yet , thats why im looking for somewher safe to park the money . Thanks for sharing the thoughts about the us treasury bills , i booked an appointment with td and rbc financial advisors , hope they could direct me . TD cashier told me they have a saving us dollar account that pays 1.2% ! Not high but flexible and more safe than tangerine i guess. That is hilarious. If you don’t trust CDIC but you will see a bank adviser. Go see them, ask what they can do, say you will get back to them. And tell us your results. Please don’t think you are in good hands with a Bank Adviser. And what do you plan to practice in Canada?? Hi Charlotte , i actually do trust the CDIC but unfortunately as i read on the forum they don't include us dollars , i'm doing my medical license exams. Definitely i wont be seeking anything with any risk as i have to study/ secure a job and this may take a year or two and i want my savings to last me as long as possible till i'm secured . Your money will not necessarily be any safer in an account at TD or RBC etc than it is at Tangerine. It will probably be fine but will still not be insured. It depends, as Norman said, on the strength of the issuer, except if deposited in a Manitoba credit union, where it is dependent on the strength of both the issuer and the Deposit Insurance Corporation of Manitoba. I'd be very very careful taking advice on this from any banker. You need to remember that, in Canada at least, these people are nothing more than glorified sales people. They have sales targets they must meet, and they will see you as an easy target as you are a newcomer. Also, in Ontario at least (and perhaps other provinces - I'm not sure), the word "advisor" has no legal backing. Anyone can call themselves an "advisor", and therefore financial institutions use this term liberally. Read their calling cards carefully. Only someone who is an "adviser" has a fiduciary obligation to provide advice that is in your best interests. Otherwise, it's the best interests of the bank that will prevail. You are under no obligation to tell us what your line of work is. I can't recall anyone ever being asked this question before. Most bank advisers have certificates from the bank they work for. All ginned up with their propaganda and what is best for bank and NOT you. Like I say, listen and say you will get back to them. Also listen for misleading words....like may...could...etc. Ask if their plan is guaranteed and ask for it in writing. And sign nothing. Yes, definitely sign nothing. If they give you something to sign, take it home with you and examine it at your leisure. If they won't let you do that, then you have your answer. They will lie to your face. Honestly! A year ago, I had an in-person conversation with an "advisor" at TD who told me she could get me a rate of 5% on a GIC. I told her flatly that I didn't believe her, and I think my expression made it clear that I wasn't interested in hearing her pitch. I was pretty sure I knew what she was referring to, and that the rate was by no means guaranteed. It turned out I was right, of course. She quickly changed her tune and stopped talking about it when I pointed out that it was not in fact guaranteed and that "GIC" means "Guaranteed Investment Certificate". You should be prepared for them to try to sell you something like this. I think it's one of their favourite products. They are often called "Market-linked" or "Index-Linked" GICs. A year ago, I had an in-person conversation with an "advisor" at TD who told me she could get me a rate of 5% on a GIC. I told her flatly that I didn't believe her, and I think my expression made it clear that I wasn't interested in hearing her pitch. I was pretty sure I knew what she was referring to, and that the rate was by no means guaranteed. It turned out I was right, of course. She quickly changed her tune and stopped talking about it when I pointed out that it was not in fact guaranteed and that "GIC" means "Guaranteed Investment Certificate". You should be prepared for them to try to sell you something like this. I think it's one of their favourite products. Wow , thanks for sharing this story! It really amazes me how a big and respected bank like TD allows such action in its name !!! Trust is the most important commodity of a bank. I have never had a complaint about their service which in my opinion is one of the best in the world that i have experienced but it seems that when u invest money with them it is a different story ! They count on people trusting them. Canadians are, generally, sort of passive and trusting when it comes to their big banks because, generally, they have been solid and reliable institutions, especially compared to most of the rest of the world. All the big banks have divisions where they have genuine "advisers", but they are really only for people who have a lot of money and want to invest it broadly. And they charge a fee, usually a percentage of your assets, for their expertise, typically 1 to 2%, depending on how wealthy you are. A lot of people who use them are satisfied with the results. The problem is that for someone who mostly wants security, the banks can't make much money off you, so they try to push you into other products. When you combine that with "advisors" who are not accountable to the public, you have red flags. Here's another tip. Once they find out you are going to be a doctor, they will be falling all over themselves to try to get your business. I'm not sure how it works for foreign-trained doctors whose future is still uncertain, but for Canadian medical students, they offer huge lines of credit and other deals that are not available to the general public. I have first-hand information on this, and it's current. 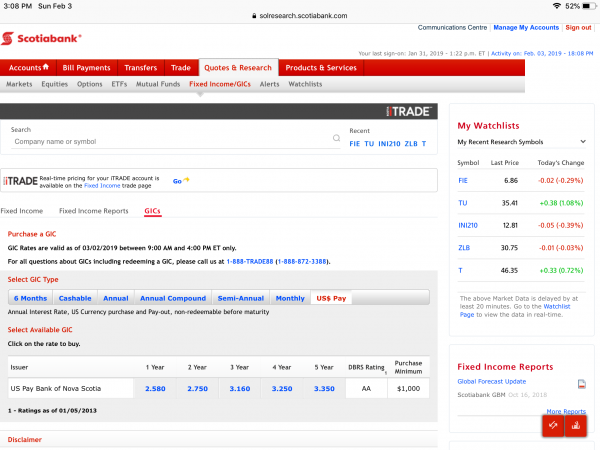 No US treasury bills through Scotia iTRADE. I couldn't find any Government of Canada US$ bonds there either.